The Orthodox Church in America Diocese of Mexico is a diocese of the Orthodox Church in America (OCA). 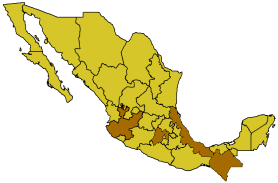 Its territory includes parishes, monasteries, and missions located in four states (Chiapas, México, Jalisco, and Veracruz) in Mexico and the Mexican Federal District. The diocesan chancery is located in the Mexican Federal District. The diocese had its origins in the Mexican National Catholic Church that was a Mexican reactionary movement away from the colonialist Spanish Roman Catholic Church. The Mexican church was led by Bishop Jose (Cortes y Olmos) of Mexico City. Leading his church to Orthodox Christianity, he petitioned the Holy Synod of Bishops of the Orthodox Church in America, in 1971, for acceptance into the Orthodox Church. The church, of some 10,000 persons, was accepted as an exarchate by the Holy Synod in 1972, and Bp. Jose was consecrated as its first bishop. After Bp. Jose's death the diocese remained without an administrator until the consecration of Archimandrite Alejo (Pacheco-Vera) as the new Administrator/Bishop of Mexico City on May 28, 2005. On October 16, 2008, the Synod of Bishops of the OCA elected His Grace, Bishop Alejo as the ruling Bishop of Mexico City and the Exarchate of Mexico. The previous Exarch of Mexico was Archbishop Dmitri (Royster) (also archbishop of the Diocese of the South), who played an active part in the acceptance of Bp. Jose's group into Orthodoxy and the establishment of the exarchate. On Sunday, January 18, 2009, the exarchate became a diocese of the OCA. This page was last edited on January 10, 2011, at 22:01. This page has been accessed 20,681 times.